In 1886, a French marine biologist aboard an American warship is scouring the Atlantic Ocean in search of a sea monster that routinely attacks and sinks passing ships. In the 19th century, an expert marine biologist is hired by the government to determine what's sinking ships all over the ocean. His daughter follows him. They are intercepted by a mysterious captain Nemo and his incredible submarine. A French professor and his daughter accompany Captain Nemo on an adventure aboard a submarine. 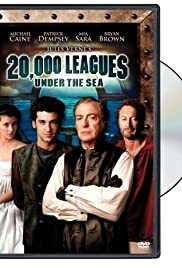 A remake of the original 1954 Disney movie, "20,000 Leagues Under The Sea", A mighty novel written by one of the greatest authors of all time, Jules Verne. Welcome to the last place on earth. Captain Nemo: The surface... I never thought I'd want to see it so badly. I was in the seventh grade when I saw this movie and going through a Jules Verne/Robert Louis Stevenson phase. I loved the original movie and when I found out the cast for the remake my face must have just lit up because my parents gave me a blank tape for when it came on. I didn't have a chance to watch it the night it was on, so I saved the movie for a rainy day. What a waste of a rainy day. It started off well, the acting was great and they were trying to hold onto the original message. Then, it kept going and going and soon I wasn't sure what the point was anymore. The ending was the worst part and I found myself taping over it a year later. Oh well, another remake that fell short of the theme.